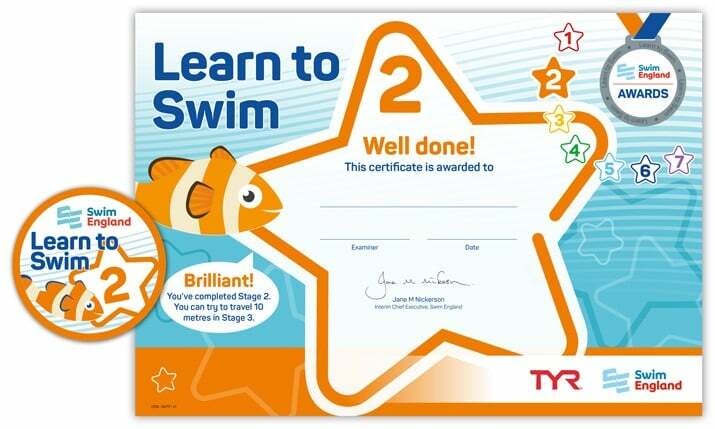 Our swimming lessons follow the Swim England Learn to Swim Framework. 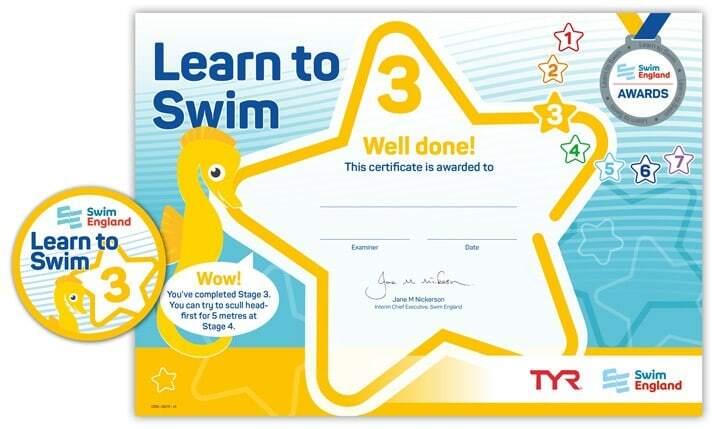 This is a comprehensive swimming development programme. Each course of lessons ranges between 10-14 weeks in length, dependent upon the Hertfordshire school term dates. Lessons are available for all abilities from beginners through to competitive level. 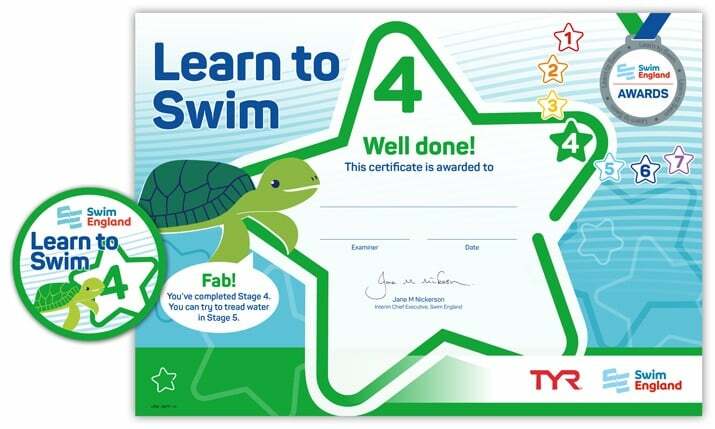 The Learn to Swim Awards 1-7 are divided into progressive stages. They make up the core, national syllabus of learning to swim for primary school aged children. Enter the water confidently, safely and unaided using a swivel entry. Submerge the face and confidently blow bubbles for 5 seconds. Achieve a horizontal float position on the front with 1 float. Achieve a horizontal float position on the back with 1 float. Travel 5 metres using an alternating kicking action with 2 floats on the front. Travel 5 metres using an alternating kicking action with 2 floats on the back. Rotate 360 degrees in an upright position with feet off the pool floor with/without aids. Push from the side unaided on the front (face in the water) into a horizontal position and attempt to travel 3 metres. Push from the side unaided on the back (hands by side) into a horizontal position and attempt to travel 3 metres. 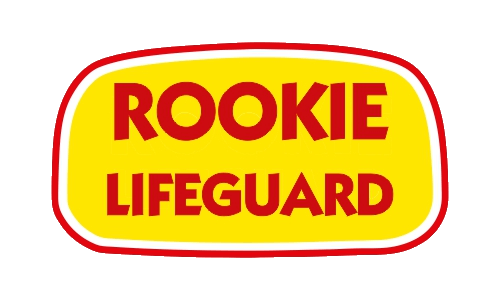 ​Jump in from poolside safely to a minimum depth of 1.0 metre. Move from a flat floating position on the back and return to an upright position without support. Move from a flat floating position on the front and return to an upright position without support. Travel using a recognised arm and leg action with feet off the pool floor on the back for 5 metres. Travel using a recognised arm and leg action with feet off the pool floor on the front for 5 metres. Perform a tuck to rotate from a flat floating position on the front, to a back floating position, then return to an upright position. Perform a tuck to rotate from a flat floating position on the back, to a front floating position, then return to an upright position. Exit the water safely without support. Push & glide from the wall towards the pool floor. Push & glide and swim 10 metres (to Swim England expected standards), choice of stroke is optional. Sink, push off on side from the wall, glide, kick and rotate into Frontcrawl. Push & glide and swim Frontcrawl to include at least six rhythmical breaths to the side. Push & glide and swim Breaststroke to include at least six rhythmical breaths. Push & glide and swim Butterfly to include at least three rhythmical breaths. Push & glide and swim Backstroke to include at least six regular breaths. Push & glide and swim 25 metres, (performed to Swim England expected standards), choice of stroke is optional. Swim 10 metres, followed by a surface dive and underwater swim for a distance of 5 metres. Tread water in a vertical position for 3 minutes. Scull head first on the back for 15 metres, with the feet at, or near, the surface throughout. 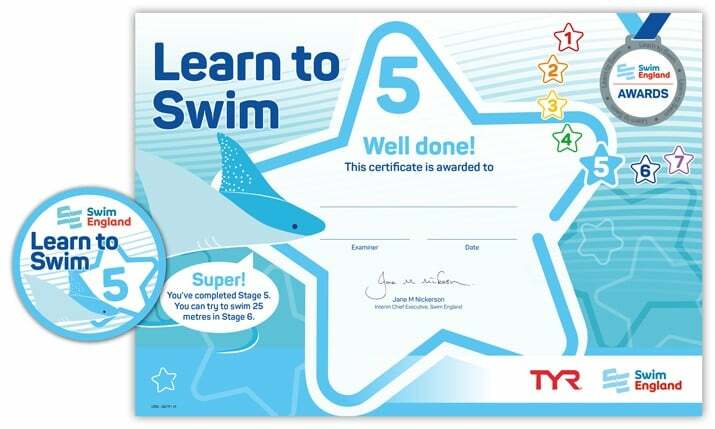 Swim 400 metres using 3 strokes, in the following order: 100m Frontcrawl, 100m Backstroke, 100m Breaststroke (must be legal throughout), 100m choice (either Fontcrawl, Backstroke or Breaststroke). Swim 25 metres Butterfly (no alternating arms or legs throughout). Climb out of the deep end without assistance. 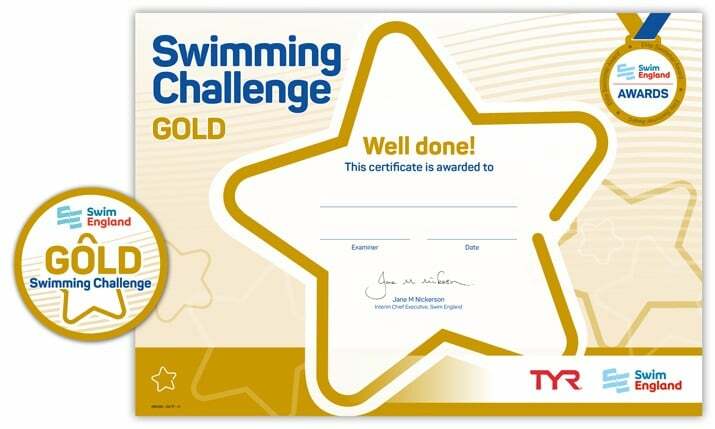 Swim 100 metres in less than 2 minutes and 30 seconds, using two different strokes, 50 metres of each. Tread water in a vertical position for 3 minutes, with one hand remaining above the head at all times. 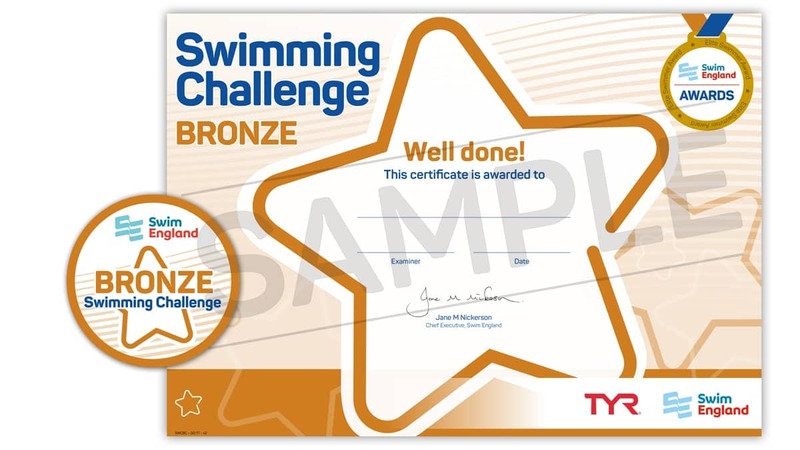 Swim 10 metres followed by performing a forward somersault without touching the bottom of the pool and continue to swim in the same direction for a further 10 metres. Scull head first on the back for 10 metres, move into a tucked position, turn 360 degrees and return by sculling feet first on the back for 10 metres, with the feet at, or near, the surface throughout. Swim 800 metres using 3 strokes, in the following order: 200m Frontcrawl, 200m Backstroke, 200m Breaststroke (must be legal), 200m choice (either Frontcrawl, Backstroke or Breaststroke). Push & glide and swim 25 metres Butterfly. Move from a flat floating position on the back and return to an upright position. Move from a flat floating position on the front and return to an upright position. Jump into the water unaided. Attempt to swim 3 metres on the front with arms recovering over the water without aids. Attempt to swim 3 metres on the back with arms recovering over the water without aids. Push & glide on the front with arms extended and log roll onto the back. Push & glide on the back with arms extended and log roll onto the front. Travel using a recognised arm and leg action 5 metres on the front, perform a tuck to rotate onto the back and return on the back using a recognised arm and leg action. Push & glide and swim 10 metres Backstroke, using a recognised arm and leg action. Push & glide and swim 10 metres Frontcrawl, using a recognised arm and leg action. Demonstrate an understanding of Breaststroke legs for 5 metres. Push & glide and swim 10 metres Backstroke (performed to Swim England expected standards). 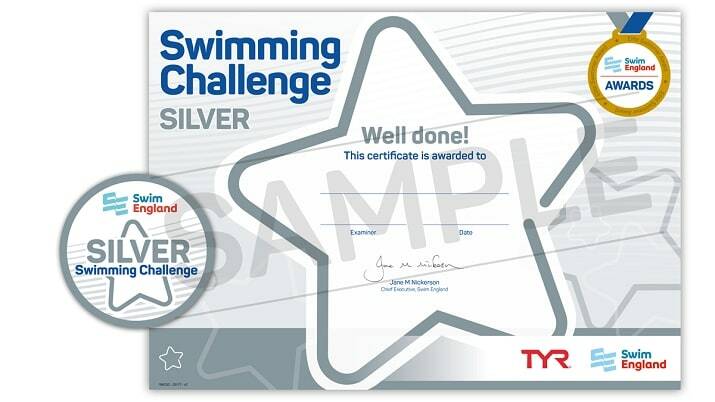 Push & glide and swim 10 metres Frontcrawl (performed to Swim England expected standards). Push & glide and swim 10 metres Breaststroke (performed to Swim England expected standards). Push & glide and swim 10 metres Butterfly (performed to Swim England expected standards). Push & glide and swim 25 metres Backstroke. 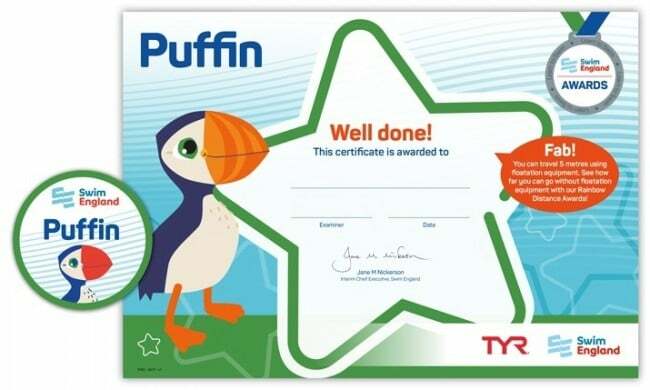 Push & glide and swim 25 metres Frontcrawl. Push & glide and swim 25 metres Breaststroke. Push & glide and swim 50 metres continuously using one stroke. Push & glide and swim 100 metres, using a minimum of three different strokes. Complete an obstacle course (using a minimum of four objects) with feet off the pool floor throughout. 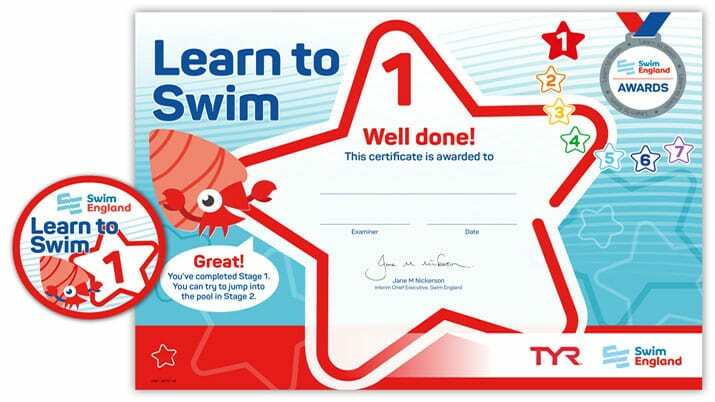 Swim 100 metres in less than 3 minutes, using one stroke. Tread water in a vertical position for 2 minutes, with one hand behind the back at all times. 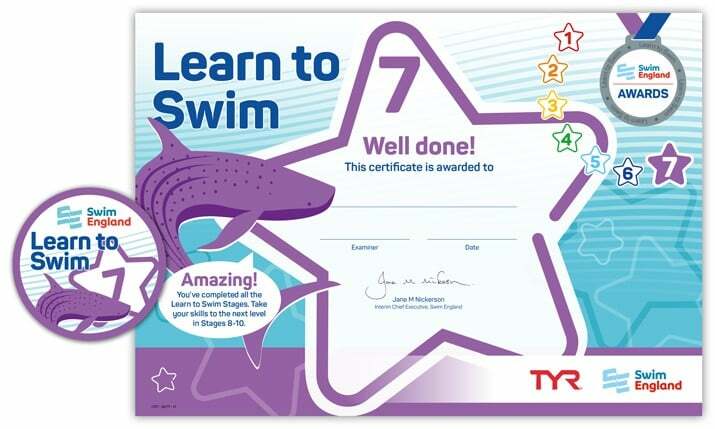 Swim 10 metres followed immediately by two surface dives into water of at least full reach depth. One head first surface dive and one feet first surface dive, bringing an object to the surface on each occasion. Scull head first on the back for 10 metres and return by sculling on the back for 10 metres, with the feet at, or near, the surface throughout. Swim 800 metres using 3 strokes, in the following order, twice through: 100m Frontcrawl, 100m Backstroke, 100m Breaststroke (must be legal), 100m choice (either Frontcrawl, Backstroke or Breaststroke). Ready to make a Splash! ?